If you are looking for a paddle that will steer straight even under force, this C4 1pc fiberglass stand up paddle with the choice of a SUP paddle color blade is the one for you. With an 8.5 inch keel-shaped blade, the SUP paddle is easier to control than stand up paddles with a larger width, and the wide point of the blade goes down deep for a more productive turn in the water. The front of the SUP paddle blade has a "flowing curved face" which allows you to skim the blade across the water easily when taking on tough turns. Also, the textured shaft provides easy grip for SUP paddlers. Unlike flat-blade canoe paddles, the skimming SUP paddle will not catch on any edges, and you have much less tendency to bang up you board than you would with a larger SUP board. 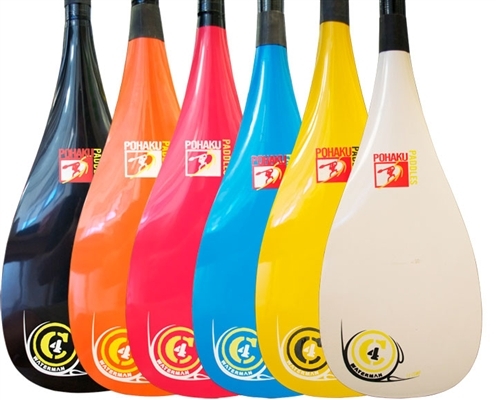 The "c4-waterman-sup-paddles">c4 waterman SUP paddle weights 28 oz. and comes in a range of colors for you to choose from. The manufacturer provides a 90 day limited warranty. Pick up a C4 Waterman Pohaku , grab your SUP board, and start Stand up paddling. 8.5 inch patent pending keel-faced fiberglass blade. Length: Up to 86 inches. C4 waterman is less a SUP paddling company as it is a company based in the values, ethics, spirit, and culture of the Hawaiian lifestyle. Its four core values are Balance, Tradition, Endurance, and Strength. Balance is not merely physical; C4 considers mental, spiritual, and organizational balance in their mission, and in their work practices and output. Endurance stands for an ability to withstand and prevail physical, economic, or mental struggles. Tradition means to C4 that it is their very essence and responsibility as a company to represent Hawaiian values, and to respect Hawaiian culture and tradition. Innovation is important to C4 as well, and so is competition and community interaction.